Here’s a very simple recipe that you can easily and instantly follow for another promising food stall business idea. This time, learn how to do cheese sticks. 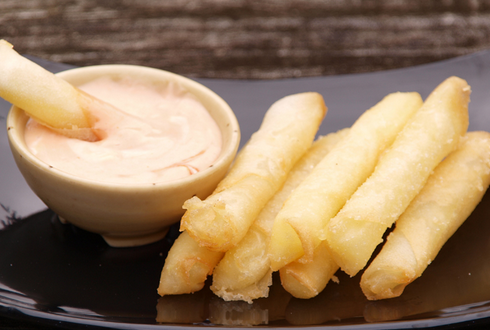 <>You surely have already tried out cheese sticks that are sold as street food. Have you ever wondered why this ‘finger-snack’ is becoming more commonly offered by small food stalls? It is because it is very easy to prepare and sell. As the name implies, it is comprised of cheese that is wrapped as small sticks and deep-fried. It even comes with simple dips like mayonnaise or ketchup. 1. Slice cheddar cheese into thin and small strips. Make sure you observe uniformity in length and thickness. 2. Wrap each strip or two in spring roll wrapper. Seal the edges using moisture from dipping your fingers into water. 3. Heat frying pan over moderate stove temperature. Put oil. 4. When the oil boils, put several pieces of wrapped cheese sticks. Deep fry for about 3 minutes or until each stick turns golden brown. 5. Remove all sticks from the pan and let the oil drip into paper towel. 6. Let it cool for a while and serve with mayonnaise or ketchup as dip.